Directed by Leonard Nimoy. Written by Harve Bennett, Steve Meerson, Peter Krikes and Nicholas Meyer (based on a story by Leonard Nimoy and Harve Bennett, and the TV series created by Gene Roddenberry). 1986. Running time: 119 minutes. 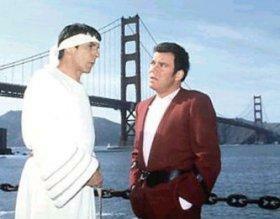 Star Trek IV - The Voyage Home never depended on big screen-style special effects pyrotechnics. If a sci-fi movie (particularly nowadays) has successfully translated to the small screen, then it is quite an achievement since most of them depend excessively on their special effects, production designs and loud soundtrack to make an impression. All of these can be found in music videos and advertisements, so you can imagine my disappointment when watching something like Armageddon or Lost In Space. One at least expects some clever story-line, reasonably in-depth characterisation and so forth to distinguish today's movies from the pap one can watch on TV - otherwise, why bother going to movies? I'm glad to say that Star Trek IV delivers on all of these counts. The special effects aren't bad, but that's not the point of it all. Besides, when special effects are allowed to overshadow a Star Trek movie one gets the likes of Star Trek - The Motion Picture, which is despised by loyal Trek followers. First, there's a clever story and like film critic Roger Ebert says of the movie: he could imagine the writers sitting back and smoking a celebratory cigar after coming up with Star Trek IV's basic premise! The premise? Earth is threatened by a "thing out there" (a huge round object in space that sort of reminded me of the spaceship in Clarke's Rendezvous with Rama novel) while the Trek crew is on its way there after wrapping up some loose ends left over from events in Star Trek III - The Search for Spock. They manage to figure out that the radio emissions sent out by the "thing" are actually humpback whale songs. The "thing" is checking up on the whales on earth. The only problem is that there are no more whales left on Earth - they are all extinct! So the Trek crew decides to travel back in time to Earth's past and bring some back to their present. Their past is, of course, our present (or at least 1986 when the movie was made). So we find the old TV Trek crew in present-day San Francisco like fish out of water - already a dependable formula for any movie (witness the Back to the Future movies). It is no accident that the two best Trek movies (the other being Star Trek - First Contact) are time travel stories. They allow us to hold a mirror to our own societies by contrasting it to the ideal and almost utopian 23rd century society imagined by Gene Roddenberry. This particular movie shows our own foolishness in destroying our environment. Like Spock we can also only deduce that exterminating the whales is "not logical." Then there's the trusted "fish out of water" formula which in this movie's case results in a type of humour and goofiness we seldom get to see in any Trek movies. Some of the jokiness works and others don't, but it is difficult not to fall for the film's likeable attitude. Most of the fun derives from we in the audience knowing the characters so well by now (they are after all veritable pop culture icons) and it is a shame that not all of the Trek movies have so knowingly exploited this - unless you count the cringe-inducing camp fire scene in Star Trek V - The Final Frontier as one of them . . .